Holly, MI – Andy’s Place located at 208 S. Broad Street in Downtown Holly, is known for their burgers and beer. But something else they have is Holly Dogman Brautwurst. 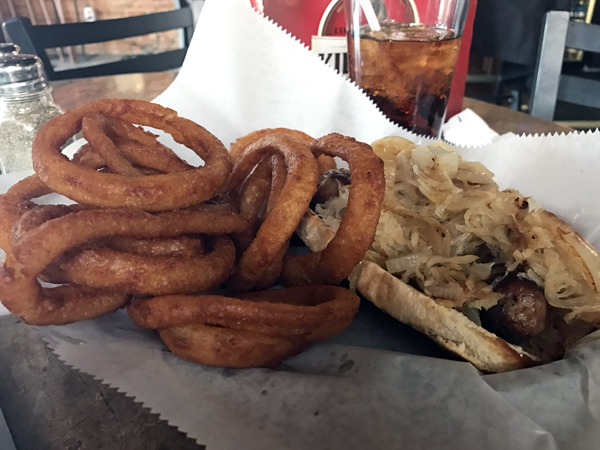 I had mine served “traditional” style, with sauerkraut, sautéed onion on pretzel bun (from Davisburg Bread Company), with onion rings. It also comes Italian-style with sautéed peppers and onions, Provolone & Boursin Cheese with Italian Dressing on the side. Andy’s Place is a sponsor of oc115.com, and it’s a great place to go and get work done during the day, or listen to live music some evenings. Learn more about the Holly Area and plan a “Daytrip to Holly” at http://oaklandcounty115.com/category/blogs/daytrip-to-holly/.